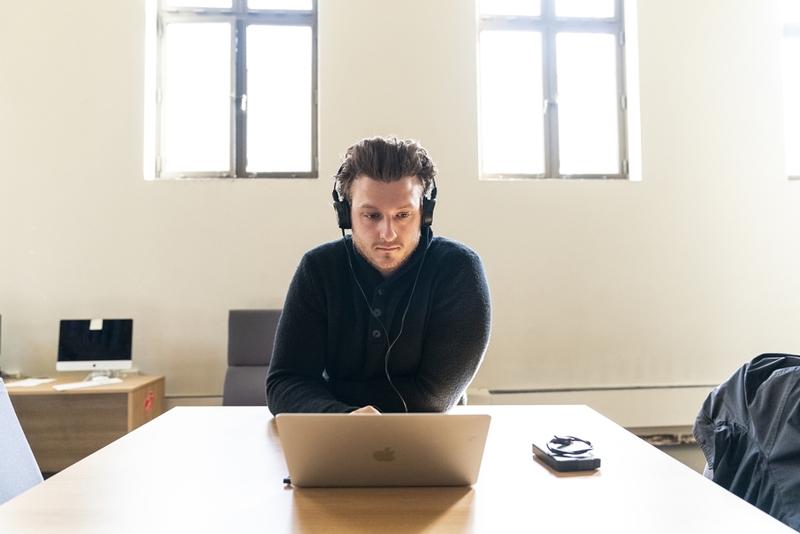 When it comes to digital technologies, you can say that Rutgers University–Camden students are well-connected. Undergraduates have regularly found guidance and support to explore their disciplines in the digital age at the campus-based Digital Studies Center and Writing and Design Lab. 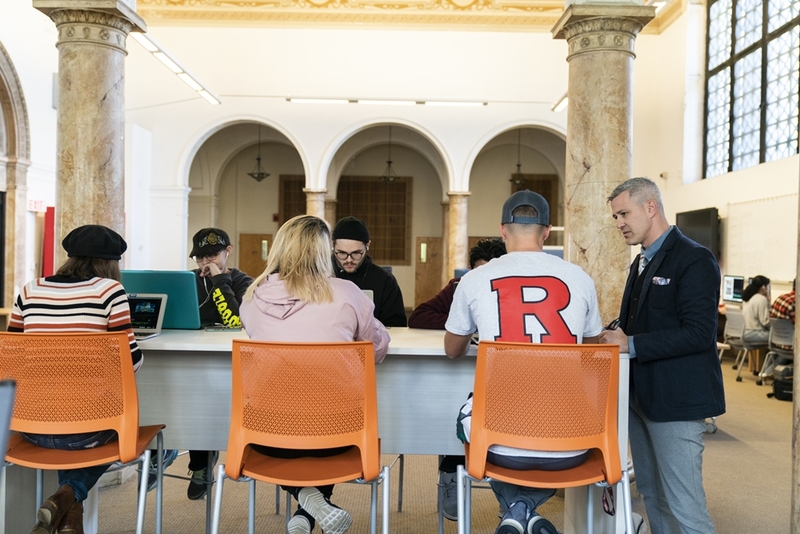 While these research and support centers once functioned separately on campus, Rutgers–Camden students can now utilize their services conveniently under one roof in the newly opened Digital Commons, located at 101 Cooper Street in Johnson Park. Occupying roughly one-third of the 100-year-old building, the Digital Studies Center will continue its mission of leading, facilitating, supporting, and promoting projects made possible by the convergence of digital technologies and various disciplines. The Writing and Design Lab occupies another third of the building, where it will continue to deliver academic literacy instruction and crucial technological skills needed to communicate effectively in various media today. The new space is well-equipped to offer English students assistance on assignments and projects ranging from traditional research papers to comprehensive, multimedia presentations. The centers’ proximity to one another, as well as a shared portion of the expansive floor space, is designed to promote inspiration and collaborative enterprise. The entire space is designed for students to work freely at workstations, or to reconfigure mobile furniture and a range of cutting-edge digital equipment to suit their needs. Travis DuBose, director of the Writing and Design Lab, notes that, by sharing the same address, the respective digital initiatives are better able to fuse their scholarly and practical aims to the immediate benefit of students. DuBose adds that the Digital Commons offers both centers the opportunity to run more concurrent student appointments and will enable the entities to offer increased design and digital consultancy services. Moreover, he says, the shared space allows both centers to draw on the student expertise that each entity has cultivated. 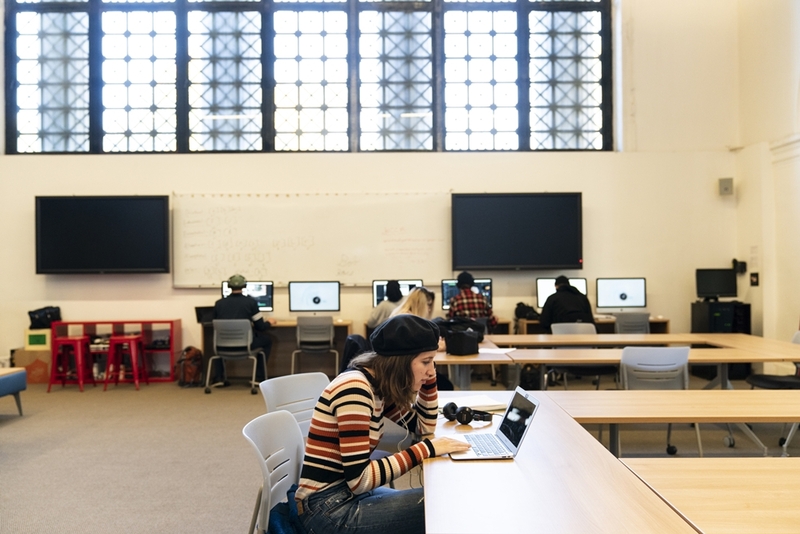 He notes that many of the students who work at the Writing and Design Lab are also digital studies majors or minors – a win-win for both the students and the centers. “Formalizing the relationship between the two research and support centers allows students to develop their skills as scholars and professionals, while contributing to our respective missions,” he says. The Digital Commons will also be the new home of the Rutgers–Camden Archive of Digital Ephemera (R–CADE), a growing collection of dated, defunct technologies, such as original Nintendo sets and early models of computers and cellphones, which students and faculty are encouraged to take apart, research, rebuild, or repurpose. Brown and DuBose further note that civic engagement is an integral part of their future plans to host a variety of events and programs bringing together scholars in a range of creative and civic activities. “We’d like to ramp up those efforts over the next few years, so we’re figuring out how to best utilize the new space for that,” says DuBose.